We’re down to the last few days of a program that could provide funding to the Greenway but we need your help. We’ve been selected to participate in a grant program sponsored by the USA Today Network called A Community Thrives. There are funds available up to $100,000 for non-profit organizations that positively impact their communities and we are honored to have been chosen. As part of our selection we’re required to raise $6,000 by this Friday, April 12th. We’re over halfway to this goal so we need your support. These funds would help us care for and maintain the 62 miles of the trail. Donations must be received by using the link here. Thank you for your support and helping us take advantage of this wonderful opportunity! We don’t know about you but we’re ready for another season on the Greenway. This Saturday is Opening Day for Trails, a nationwide event that encourages people to kick off the spring by enjoying their favorite trail. 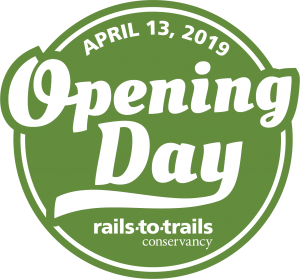 Our partners with the Rails to Trails Conservancy celebrate this day each year and we hope you’ll take advantage of this opportunity to get out on the Greenway for a walk, run or ride to celebrate the beginning of another year on the trail. To give you a little more incentive the RTC is giving away some fantastic prizes for anyone who takes part in Opening Day, including a new Trek bicycle. You can register to win here. The National Trails Day 5K is coming up! 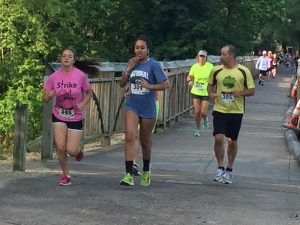 Our first event of the season takes place Saturday, June 1 with a 5K run/walk on the Cardinal and White River Greenways. The race starts and finishes at the Muncie Depot. Awards will be given to overall and age group winners and shirts are provided to everyone registered by May 24. We have a discounted rate for students of only $10. You can sign up and get more information here. We have a full weekend of activities coming up with Bike Fest July 26-28. Friday kicks off the festivities with a community group ride from the Muncie Depot. Saturday is the Great Greenway Tour which offers the opportunity to travel the trail and enjoy SAG stops along the way. Back at the Depot we’ll have a variety of group led tours through Muncie and a vintage bike show. Sunday wraps up with the Muncie Power Products criterium races around downtown Muncie. We appreciate the support of Old National Bank, our presenting sponsor. 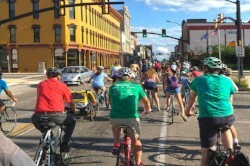 Look for more information on Bike Fest, including registration, in next month’s newsletter.